Last week Monday we received some news from our principle. It was exciting and unexciting at the same time. The news we received was moving to another school. Our school were all surprised and shocked. We had to move because some workers were working on our roof. On Wednesday we catched the bus to Tamaki primary school to do our learning there. As we arrived there Tamaki primary school welcomed us with a Maori haka which was awesome . Later on we walked to our classrooms we were chose to be in. Our class was in the art room. Because there were lots of art supplies we decided to do some art and coloring all day. The next day we were still stuck Tamaki so Mr Reid gave us proper work. Then we received some exciting news from Tamaki primary schools principle Miss Kelly. She invited us to their Tongan language week performance. 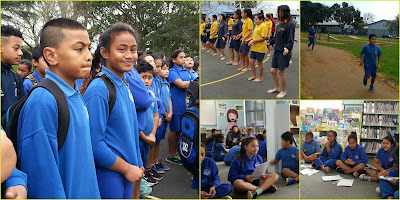 We saw different dances and learned some facts about Tonga.